It’s important for home buyers to understand that a mortgage commitment letter in NYC does not guarantee that the bank will fund your loan. As you will see from the NYC mortgage commitment letter sample below, there are many contingencies in place for the bank to revoke its loan commitment to you. If you’re about to submit an offer and deciding whether to waive the mortgage contingency, it’s important to understand what a mortgage commitment letter entails and how much assurance a loan commitment offers you in the first place. What does a NYC mortgage commitment letter sample look like? 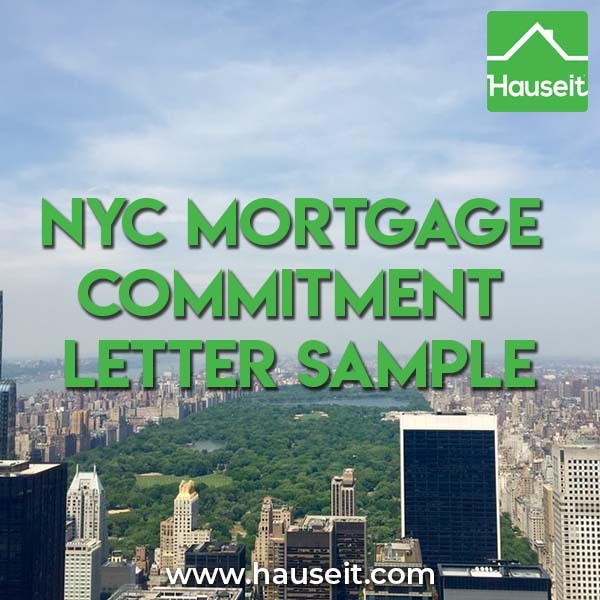 What are some typical commitment conditions in a NYC mortgage commitment letter sample? What are sample closing conditions in NYC? This is an example of a standard mortgage loan commitment letter that would be issued to a New York City condo or co-op apartment buyer. There are additional sections in this NYC mortgage commitment letter sample you should review such as Commitment Conditions. It is a pleasure to notify you that your application for a mortgage loan has been approved subject to the following matters set forth below and on pages 2 and 3. This approval is not a final commitment. Due to the fact that interest rates are subject to change without notice, your approved payment and loan amount may change if interest rates increase or decrease. This commitment will become effective upon compliance with the terms herein and, if applicable, the receipt of your check in the amount of any non-refundable commitment fee (“stand-by fee”). It is understood and agreed that if this mortgage loan is not settled in accordance with the terms and conditions of this commitment, the Lender shall retain this fee as earned charges for the origination and approval of this loan. Your initial interest only principal and interest (P&I) amount is $[Amount]. This amount does not include any escrowed amounts and may change if there is a change in loan terms. [ X ] An Escrow Account is not required. [ ] An Escrow Account is required. Even if an Escrow (Impound) Account is not required at time of settlement, subject to the terms of your specific loan documents, the Lender may set up and require an Account should the taxes or insurance on the subject property ever become delinquent. The Evidence of Title is to be provided to the Lender and must indicate no liens, encumbrances, or any adverse covenants or conditions to title unless approved by Lender. The Evidence of Title must be issued from a firm or source, and in a form, acceptable to Lender. Borrower will be charged for the cost of providing such title and the cost of recording documents, all of which will be ordered by Lender unless requested otherwise. The Lender reserves the right to terminate this commitment prior to the settlement of the loan in the event of an adverse change in your personal or financial status, or if the improvements on the property are damaged by fire or other casualty. All Items Listed on the Commitment Conditions Addendum Apply. THE FOLLOWING CONDITIONS MAY APPLY TO YOUR LOAN DEPENDING ON THE LOAN TYPE AND TERMS. A balloon loan matures before the loan is fully amortized. The balance of the loan will be due in a lump sum payment at maturity. Prior to settlement, we will require an original insurance policy and/or binder containing fire and extended coverage (i.e., windstorm, hurricane, hail damages, or any other perils that are normally included under an extended coverage endorsement) insurance in an amount equal to the lesser of 100% of the insurable value of the improvements, or the unpaid principal balance of the mortgage as long as it equals the minimum amount (80% of the insurable value of improvements) required to compensate for damage or loss on a replacement cost basis through a company acceptable to the Lender, and a receipt showing premiums paid in advance for one year. The insurance policy shall also contain a standard mortgage clause in favor of Lender. We cannot require you to obtain a policy which exceeds the guaranteed replacement cost of the improvements securing the loan. If the property is new construction and you are not able to occupy the property immediately after closing, you will be required to furnish an original fire/hazard insurance policy or binder, including a Builder’s Risk Rider. If this is a renovation of an existing dwelling that will remain occupied, a Builder’s Risk Rider is not necessary. Loan Commitments issued for these types of mortgage loans, including, but not limited to FmHA, RHS, FHA, and VA, are subject to all the terms and conditions of the Agency’s commitment, or the VA certificate of reasonable value, as well as the rules, and regulations, and all applicable requirements of the Farmers Home Administration, Rural Housing Service, Department of Housing and Urban Development, the Department of Veterans Affairs, and/or other state or municipal authority. By signing and accepting this commitment, you acknowledge that if the property securing this loan is in an area identified as having a special flood hazard you agree to these insurance requirements. Our policy, in order to best protect collateral interest, is to adhere to the more common industry practice of requiring flood coverage for the lesser of: the full 100% Replacement Cost Value or the maximum amount of insurance available under NFIP for the particular type of building; currently $250,000 per residential dwelling/condominium unit. A copy of the declaration page or application signed by the agent, along with proof premium has been paid, is required prior to closing. Flood insurance is mandatory now or in the future if this property has been or will be determined to be in an area which has a special flood hazard. Federal Law requires that flood insurance, available through any agent, must cover the lowest of: the outstanding principal balance of the loan[s]; the maximum amount of coverage allowed for the type of building under NFIP or the full replacement cost value of the building or contents securing the loan. Monthly deposits and initial deposits as determined by Lender are required to cover the payment of estimated annual real estate taxes, special assessments and, if applicable, FHA or Private Mortgage Insurance Premiums. Lender may also require additional deposits for hazard or other insurance if required for this loan. Such deposits are to be placed in a separate escrow or impound account. If required, all unpaid and future special assessment installments must be paid in full prior to, or at time of settlement. The mortgage or deed of trust, note and other pertinent loan documents will be provided by Lender and must be signed by all applicants that are to be contractually liable under this obligation. Further, the mortgage or deed of trust must be signed by any non-applicant spouses if their signature is required under state law to create a valid lien, pass clear title, or waive unclear rights to property. Note: Samples of loan documents are available upon request. ADDITIONAL CONDITIONS FOR CONSTRUCTION LOANS. Improvements are to be built in a good and workman-like manner in strict accordance with plans and specifications furnished Lender and in compliance with applicable building codes. After completion, said improvements shall be approved by a representative of Lender and an occupancy permit shall be issued by local municipality. Any changes, whether they be additions, deletions, or alterations, of the plans and specifications, must be approved in writing by Lender in order that this loan commitment remain in effect. Evidence must be submitted that the net proceeds of our loan are sufficient to complete the construction of the building, free and clear of all claims of Mechanic’s Liens for labor and material. All disbursements will be made upon the order of the borrower upon presentment of proper waivers of lien, subject to compliance inspections by the Department of Veterans Affairs, the Federal Housing Administration, or Lender, not to exceed 80% of the value of the work done. The remaining funds will be held back until the certificate of completion and/or occupancy certificate is issued. I (WE) accept the terms and Conditions of this Commitment and will notify Lender if there are any changes to the information provided on the application before the closing of the loan. Take special note of the cancellation clause listed above. If you lose your job or suffer some other financial setback, the bank will have cause to terminate your loan commitment! This is an example of a some typical commitment conditions in a NYC mortgage commitment letter sample. Note the long check-list of tasks that must be completed in order for the lender’s commitment to be valid. Borrower: The Closing Disclosure will be provided to you in advance of your closing indicating your loan terms and is followed by a government mandated waiting period before the actual closing occurs. Receipt of the Closing Disclosure does not indicate all loan conditions have been satisfied which must occur prior to closing. Changes of any kind that occur after the final Closing Disclosure has been delivered to you may result in an additional waiting period prior to closing. Borrower: This loan is also subject to all other lender specified conditions and must comply with all applicable federal, state, and local laws and regulations. Lender: Loan was approved based on the following parameters: Debt to Income Ratio not to exceed [ ]%; Total Reserves required for Transaction are $[Amount] or 12mos (subject to change) plus closing cost & prepays of $[Amount] (subject to change). Required Liquid Funds for transaction can be no less than $[Amount]. If any of these parameters change, as required by product guidelines, the loan will be subject to re-underwriting. Note that this hypothetical lender does not allow any subordinate financing. That means you won’t be able to take out a 2nd lien home equity line of credit at a later time. Please also note that if your purchase doesn’t close in time, the lender may need to re-do the NYC mortgage underwriting process. Your application for a [Bank Name] Co-op Loan has just been approved. Enclosed you will find a commitment letter which provides you with specific details regarding your loan approval. We urge you to read it carefully as it contains important information on the financing terms and the documentation that is required in order to close your loan. 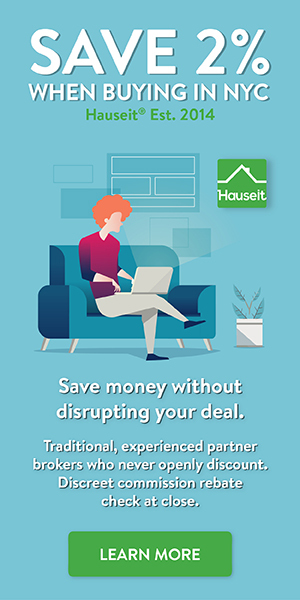 You must sign the commitment and return it to us within ten (10) days of the commitment or before the expiration date, whichever is sooner with any fees specified. Please note that this commitment letter contains two critical dates. If you elected to lock in your interest rate and points there is a rate expiration date. If you do not close your loan on or before the rate expiration date, the terms and conditions will change. In addition, there is credit document expiration date. If you do not close your loan on before this date you will need to satisfactorily update certain credit documents in order for the terms and conditions of this commitment letter to apply. If your rate and points have not been locked, the rate expiration date will be established once you elect to lock in your rate. You must lock in your rate at least five business days prior to loan closing. Please read the commitment letter and riders carefully, as they contain conditions that must be satisfied prior to your loan closing. It is incumbent upon you to make sure that we are in receipt of all items listed. These items must be reviewed and approved at least three (3) days prior to loan closing. Again we must emphasize that you cannot close your loan unless all these items have been satisfied. We have notified the closing attorney for [Bank Name] of this loan transaction. Arrangement and instructions for closing your loan should be obtained by contacting the [Bank Name] attorney named in your commitment letter. A loan closing can be scheduled shortly after all necessary documents have been received by [Bank Name]. We encourage you to have your attorney contact the [Bank Name] closing attorney to review the requirements. This should help to ensure that your closing goes smoothly. Thank you for choosing [Bank Name] for your financing needs. We are delighted to have you as a client. We have received today from [Bank Name] a copy of a commitment letter for a co-op loan and will represent [Bank Name] at the closing. Please be advised that we cannot schedule a closing unless we receive confirmation that the conditions required by [Bank Name], prior to closing, have been satisfied and the conditions required at closing will be obtainable and brought to the loan closing. Enclosed with this letter you will find three copies of Recognition Agreements. The Recognition Agreement must be delivered to and executed by an Officer of the Cooperative Corporation. The fully executed Recognition Agreement must be delivered to our office prior to loan closing or it must be brought to loan closing. We will be unable to close a co-op loan without the original executed Recognition Agreement with the corporate seal. Enclosed with this letter you will find a Uniform Commercial Code Authorization Form. This document must be signed by each person who will be on title and promptly returned to our office. This document is necessary for [Bank Name], to obtain a security interest in the cooperative. Upon our receipt and/or confirmation of certain information i.e. section/block/lot numbers of the building same will be inserted in the financing statement prior to filing. Please be sure to note that the executed Uniform Commercial Code Authorization Form and the check required by paragraph 3 below must be remitted to our attention at the time you accept your commitment letter to a assure a timely closing. To ensure that [Bank Name] has a proper security interest, a Cooperative search of the appropriate records will be conducted solely for [Bank Name]’s benefit. The search will be ordered by our firm and will be reviewed and approved by our office prior to loan closing. Payment of the lien search must be remitted to our office at the time you send back the UCC-1 Authorization form. The cost of the search is $275.00 and the filing fee for the UCC-1 is $100.00. Please remit a check for $375.00 made payable to [Name] for the lien search and the recording of the financing statement. Unless paid prior to loan closing, all charges and fees due to [Bank Name] must be paid from the loan proceeds. If you call our office the day before loan closing, we will advise you of the exact amount being deducted from loan proceeds. The commitment letter has two expiration dates; one is the Commitment Expiration and one is the Rate Lock Expiration. The loan must close and funds must be disbursed on or before the earlier of the Commitment Expiration or the Lock-In Expiration. In the event the loan is a refinance transaction and it is subject to the required three (3) business-day right of recission it must close four (4) business days prior to the expiration of any applicable rate lock agreement. – We have been advised by [Bank Name] that all commitment conditions have been satisfied. – The U.C.C. -1 financing statement has been filed. – We have a copy of the proposed Stock Certificate and the first page of the Proprietary Lease. At closing, the original Stock Certificate and Proprietary Lease must be delivered to [Bank Name] Closing Attorney. – We must be in receipt prior to or at loan closing of a blanket insurance policy for the co-op evidencing sufficient dwelling coverage. [Bank Name] requires at least two (2) business days to schedule a loan closing. We are committed to providing you with the highest level of customer service. If you should have any questions please feel free to call us at [Phone Number]. Is Buying a House Worth It? Here is a mortgage commitment letter my brother recently received for a co op apartment purchase in NYC, price just under $500,000. We were a bit taken aback by all of the conditions attached to the commitment letter. Doesn’t seem like a sure thing. Wanted to share (names redacted of course) and see if the community had any advice and anything we should look out for. – Receipt and approval of the conditions listed below in Loan Conditions. – Verification of the information you have provided or discovered during our underwriting. – Receipt and approval of additional or updated information we request for re-verification. – No changes to your income or credit standing. – No changes to the property. – The annual percentage rate on your loan not exceeding a certain threshold set by the Truth in Lending Act and its implementing regulation. – No changes to investor guidelines or FHA/VA requirements for insurance/guarantee. – No changes to [Bank Name] guidelines. If this is a purchase transaction please refer to the enclosed Commitment Letter. Review the Loan Conditions listed below for a list of items we need from you before your loan closes. Pay particular attention to documents and conditions listed in the section titled “Responsible Party” which appears under the heading “Prior to preparing closing documents”. You have 30 calendar days from the date of this letter to provide these documents and meet these conditions. Otherwise we will assume that you do not wish to proceed and will give no further consideration to your application. If you are not ready to continue at the present time, we look forward to working with you in the future. This conditional approval is not a commitment to make a loan at any particular rate or on specific terms or for any particular period of time, nor does it guarantee the availability of the type of loan for which this Conditional Approval is given. This notice does not lock in the interest rate. You will receive a separate Interest Rate Lock-in Agreement Confirmation document which states whether your rate is locked or not. The interest rate for the loan HAS been locked, and the lock expires on 06/19/2018. – Provide current hazard insurance policy and any applicable riders or addendums, including second lienholder in second position when applicable. Must display [Bank Name] Its successors and or assigns [Name & Address] as loss payee. – Provide the following documentation for the sales contract: All strikeouts/alterations need to be initialed and dated by all parties. Missing Lead based paint disclosure and buyer/seller attorney review letters. – Obtain an appraisal/valuation of the subject property. – Obtain evidence of clear lien and judgment search from closing attorney/agent on all applicants, property seller, and the co-op corporation. – Obtain evidence that the condo or co-op project is approved by the [Bank Name] Project Review Office. – Provide a completed and signed Form 4506-T (Request for Transcript of Tax Return) for all applicants at closing. A separate 4506-T is required for each tax return type (e.g. individual IRS form 1040 and business forms 1120, 1120S, or 1065) for all income used to qualify. Form is provided by the lender. – Verify that any interested party contributions do not exceed 6% of the value or the actual closing costs. – Obtain verification of the applicant(s) identity to comply with the [Bank Name] customer identification process and the USA Patriot Act.